A surprising number of options are now available for kitchen sinks. The kitchen sink’s material, it’s style and the number of sinks are the three keys to narrowing down your design. Before your contractor bombards you with questions, you should familiarize yourself with the different sink options so you can communicate your plans clearly to your builder. Traditionally, kitchen sinks are made of stainless steel or enamel-coated cast iron. They are durable and long-lasting. Stainless-steel sinks are good for heavy use and washing pots and pans. The enamel-coated sink is susceptible to chipping and unfortunately, is not as durable as the stainless. Composite sinks are the current trend. The term “composite” means that the sink is created with two or more different materials. Naturally tough, durable, and heat resistant, composite sinks include quartz, acrylic, and granite. Quartz sinks are a combination of quartz and resin. This is a relatively affordable option. Acrylic sinks, because they are combined with fiberglass, are the most affordable of the composite sink options. Granite is the costliest version but will give your kitchen a high-end, designer look. In the past, kitchens had two identically-sized sink basins. This was ideal for most homeowners, as many were still hand-washing their dishes. With the advent of dishwashers, kitchen designers began to question the twin-basin sink design and more options emerged. One option is to use a single basin for your kitchen sink. One large, deep basin that is big enough to fill a large stock pot or hand wash a large cookie sheet. Another option is the double basin style of sink. Homeowners can choose from twin basins or sinks with one large basin and one smaller one, and even one deeper basin and one shallower. The farmhouse sink, also called the apron front sink, turns the sink area into a focal point of the kitchen by extending the sink front outward to replace the countertop and cabinet. Although the name implies a rustic, country farmhouse feel, the apron front sink is available in a multitude of styles, appropriate for any décor. Most often, the apron front sink is a single basin, but there are double basin varieties available. Top mount kitchen sinks are placed into a hole cut in the countertop material. Although it is an easy do-it-yourself project, the top mount sinks invariably have a raised lip around them that holds the sink in place. This lip, or rim, interrupts the smooth, cohesiveness of the countertops. Dirt and crumbs will collect at the rim over time. The under-mount sink is attached from beneath the counter, eliminating a lip or rim. Instead, the countertop lays smoothly on the edge of the sink. There are two drawbacks to under-mount sinks. First, they do not come with a hole for your faucet. You will need to have one cut into your countertop. Second, under mount sinks are not as easy to install, so leave this task to the professionals. 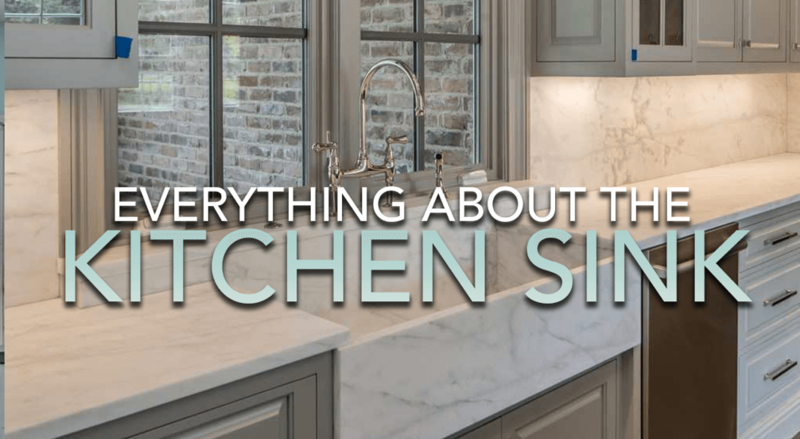 The final decision you need to consider is how many sinks you want in your kitchen. This was an easy decision in the past; homes had just one sink area in the kitchen. But, in today’s chef’s kitchen, it is not uncommon to have more than one sink area. In addition to the traditional kitchen sink, homeowners also add a prep sink, vegetable sink, or a wet-bar sink. Often incorporated into the kitchen island, the prep sink is a smaller sink that is conveniently located to food preparation areas. The wet-bar sink is located near the bar and provides an easy spot for disposing of drinks and ice. The vegetable sink, like the prep sink, is small and usually has a lot of countertop space around it for chopping. At the end of the day, all of these decisions come down to personal preference. Consult with your designer if you have questions or concerns.